I think I may have a distorted idea about what constitutes my "normal" running pace. In my mind I consider myself a 9:00 miler but in truth I'm not. Garmin Connect provides reporting tools that allow you to analyze your history and this helps me compare where I am today against previous periods. Sifting through the data and applying the appropriate filters allows me to see what paces I was doing last year on the treadmill, the road, the track and the trails. My overall pace, current or historical, means very little because it's a blend of those running types. Comparing or just reviewing anecdotal data, I see that my normal road pace is about 9:15. There is a margin of error because this data comes from my Garmin which has an over/under tolerance of about 3%, depending on its state of calibration. I often move the footpod from pair to pair depending on the type of running that I'm doing. When calibrate accuracy to .01 mile on my Adrenalines and then move the footpod to my New Balance trail shoes I'll get a different result. It's an inexact method but it's good for measuring trends over time. Prior to last Sunday's race I had focused primarily on building up my running legs with less concern about pace. In the first two post-race runs this week I kept the speed dialed down in consideration of recovery. Today I decided to start faster and maintain a pace that was on the edge of discomfort. About halfway through I increased the speed a bit more and at the end I expected to see that I'd run the type of pace I do for road races (8:19-8:40). I was surprised to see the Garmin readout say I'd covered my distance at 9:00 per mile. It sure seemed faster than that. It's possible that the Garmin under-counted because of calibration variance and I was on the treadmill and not on the road. 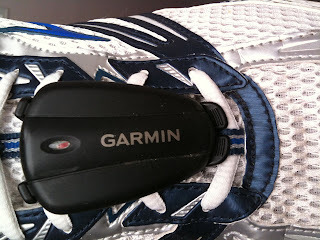 Next week we'll have our new treadmill that will provide a readout that I can compare to the Garmin's. It was nice to run my "normal" pace today, despite my delusions of grandeur.